As soon as you enter your room, you leave all that noise behind you and sink into a world of pure white comfort, with pure furnishings adding as much style as practicality to ensure you a relaxing, care-free stay.1K Paris’ rooms and suites are really modern and spacious with changing lights on-demand, top of the range bedding, huge Italian-style showers or bathtubs placed on the floor for a romantic and enchanting atmosphere. Plunge happily into 70 sqm of pure luxury and design with Queen size bed, a duplex fully equipped with a lounge area and double sofabed upstairs, two bathrooms offering a choice of shower or bathtub , a minibar, a handy phone, two Smart TVs with free VOD film access, a heated outdoor pool, and just to add a cherry atop the cake, an idyllic terrace where we can bask in the sun on the deckchairs and enjoy a magnificent view over the Parisian rooftops. This 45 sqm duplex includes a living-room downstairs with double sofabed, the room upstairs with Queen size bed, two bathrooms offering a choice of shower or bathtub, a minibar, a handy phone and two Smart TVs with free VOD film access. XL Junior Suite, with 40 sqm include a queen bed or twin beds, a bathroom with shower and bathtub, a minibar, a smart TV with free VOD film access and a handy phone. Theses suites offer a view over the inner courtyard. With an area of 25-30 sqm, the L Deluxe rooms offer a view over the inner courtyard and are equipped with a queen bed or twin bed, a bathroom including shower and bathtub (subject to availability) , a minibar, a handy phone and a smart TVs with free VOD film access. 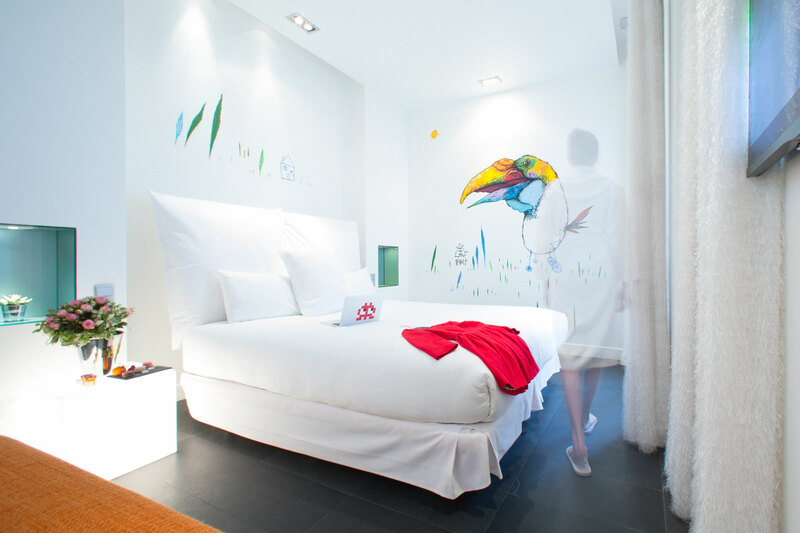 With an area of 20-25 sqm, the M Superior rooms are equipped with a queen bed or twin bed, a bathroom including shower and bathtub (subject to availability) , a minibar, a handy phone and a smart TVs with free VOD film access.